voestalpine plans to develop powder types that are more corrosion-resistant and stronger for increasingly sophisticated applications. The voestalpine Group’s High Performance Metals Division plans to invest €20 million in expanding metal powder production for additive manufacturing (AM) at its subsidiaries Böhler Edelstahl GmbH and Co KG, Austria, and Uddeholms AB, Sweden. Voestalpine says that it is a global pioneer in 3D printing and wants to push ahead with its activities in this area by setting up new research and development centers in non-European growth markets. At its new center it plans to develop powder types that are more corrosion-resistant and stronger for increasingly sophisticated applications. This story is reprinted from material from voestalpine with editorial changes made by Materials Today. The views expressed in this article do not necessarily represent those of Elsevier. 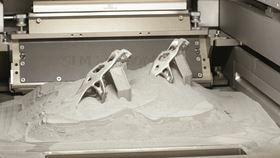 The voestalpine Group has opened a research and development center for the 3D printing of metal parts at a site in Düsseldorf.